When the phrase, ‘dynamic duo’ is thrown around, many people will think of the obvious ones such as Batman and Robin, Captain America and Bucky Barnes, or Han Solo and Chewbacca. 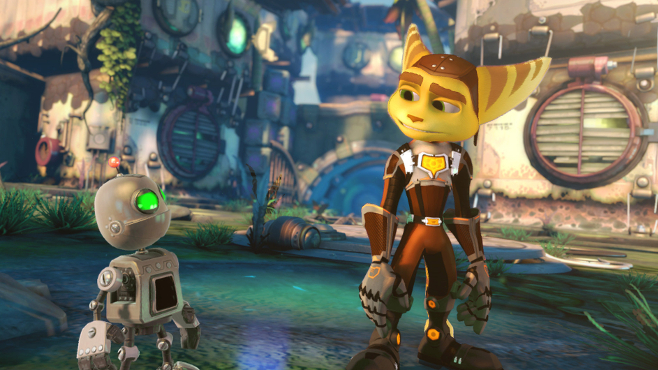 However, Ratchet & Clank has a special duo of its own. Though Insomniac Games hasn’t released a Ratchet & Clank title in a few years, their latest game retains a lot of what has made the series successful over the years. There is still plenty of comedy mixed in with all of the destruction and havoc, and there are plenty of well-crafted enemies to slay in the process. Not to mention the base controls are relatively simple and easy to learn for players of all ages. Now, if you have never played any of the games from this series, here comes the low down. The game will start you off with a little intro which doubles as a small backstory as to what is going on. You might watch it and think, "Impressive, but can it keep this up?". After the scene ends you are thrown right into the game where you learn the easy button layout, and dive into combat quickly thereafter. Being an action/adventure game it only makes sense to throw you right into the mix of smashing and shooting everything in sight. The first level proves this point alongside being a helpful tutorial on how to play, and quickly connecting you to the core characters. Once you make your way through the initial combat and platforming sections, you are brought to a world in which, unlike the first level, you can leave and then revisit to stack up on all the goodies you may have missed out on the first time, such as skill points. The game continues to expand itself with colorful new worlds where you can head to and eviscerate all the enemies there to progress through the storyline. As usual the story is light-hearted and never takes itself too seriously. Reminiscent of a Pixar film, it has a cast of wild characters, some audaciously cruel, and others unconditionally nice. Oh, and the goofy Qwark is back to deliver some chuckles. Your priorities will likely lie in making Ratchet stronger and finding collectibles rather than reaching the ending to see what happens. This game also has a very enticing selection of weaponry that varies from the Omniwrench, which you just bash into the enemies heads, to the Winterizer, which turns enemies into snowmen. What may be the best weapon of all is Mr. Zurkon, a robot ally that can be deployed and will help to vanquish your foes while making hilarious comments at the same time. 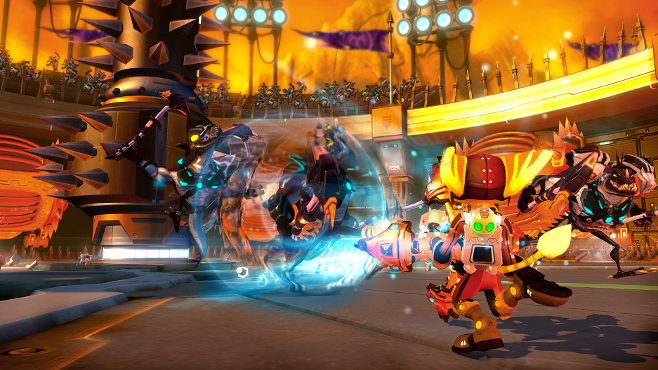 The generous list of fun-to-use weapons is what has separated Ratchet & Clank from other series in the past, and it doesn't disappoint here. At some point you will learn about the Destructopalooza, which is essentially an arena world in the game that you can spend as much time killing thugs, getting goodies, buying new armor, and upgrading all of your weaponry as you’d like. There are of course plenty of incentives as well, such as the schematics to the most destructive weapon in the game and obviously currency for buy more armor and weapons of chaos. This world is the perfect place to just grind away, but the only downside is that you will have to progress with the storyline at some point to gain access to more combat levels and weaponry to add to your arsenal. In other words, it's not as open-ended as you might like. All in all, this game is shorter than its predecessors, but makes use of its time with quick development and frequent excitement. The worlds are not only lively, but great to look at and explore as you blast through the various sections to rid the universe of its evil enemies. If you enjoyed previous installments of the series, then you'll feel right at home, and chances are you won't regret your purchase given it's $29.99. Kyle Ames is a Contributor for CraveOnline. Review based on PS3 version. Copy provided by publisher.